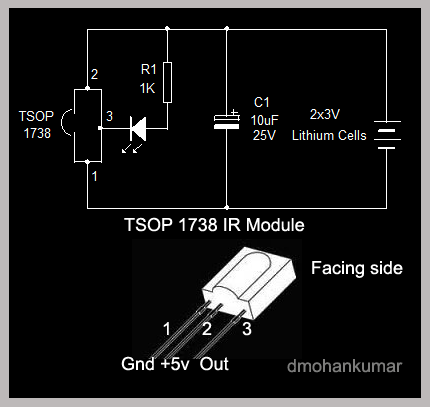 TSOP 1738 requires 5 volts maximum and above this, the device will be damaged. So a well regulated 5 volt supply is necessary for its proper function. Normally when it is in the ideal state without receiving the IR rays, its output source 5 volts. When the module reveives, IR rays, it sinks current and output turns low to zero volts. According the coded IR pulses from the remote hanset, the output of the sensor turns low and high altenately. The speed of this transition depends on the bandwidth of the coded pulses. Check the pins of TSOP 1738. The facing side has a projection inside which the Photodiode is present. So the pins are numbered as 1,2 and 3 in the facing side. Pin1 is ground, pin2 is Vcc and pin3 is output. Fig. 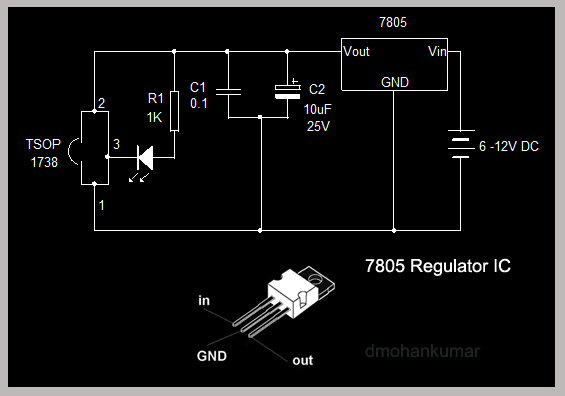 1 shows a simple Remote tester circuit using TSOP 1738. Sometimes the Infrared LED in the remote fails to work. So by using this tester, you can test the remote. When the remote is focussed on to the sensor and any button is pressed, the Green LED blinks, if the remote is working. A simple way to test, is focussing the Mobile phone camera towards the IR LED of remote. But it shows only the light of IR LED. The pulsation of the IR LED cannot be detected using this method. But this circuit solves the problem. On pressing each button of remote, the Green LED blinks in a different way to confirm that all buttons are working. The circuit works off two 3 volt Lithium button cells. Fig. 2 shows the way to provide regulated 5 volts for the circuit, if the supply voltage is higher than 5 volts. 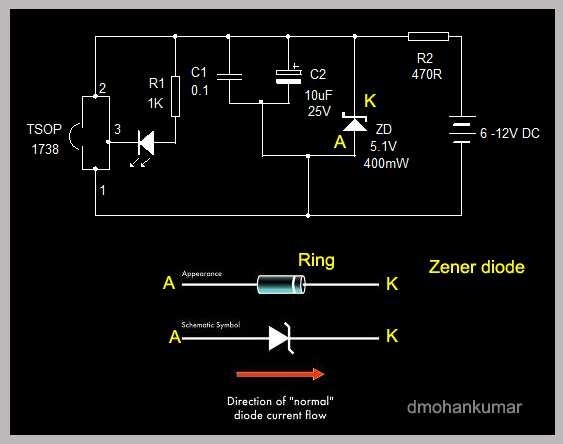 Here a 5.1 volt Zener diode is used across the supply lines to drop, higher voltage to 5 volts. Capacitor C1 and C2 removes noise from the power supply to facilitate stable working of the sensor.Resistor R2 reststicts the Zener current. 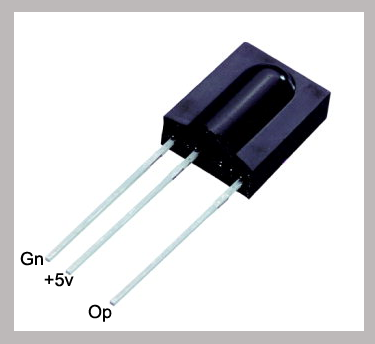 Fig.3 shows the use of a Voltage regulator IC 7805 to give 5 volt to the circuit. Table 1 shows the pin configuration of some common IR Sensors. The circuit is easy to understand. Thank you for the wonderful guidance. I tried this circuit. when I connect the TSOP 1738, the output voltage of 7805 becomes 0V. When I diconnect TSOP, I get 5V at output of 7805. TSOP 1738 gives 5V output in standby and sinks current when it gets IR pulses. So naturally without IR, it should give 5V. You mentioned that 7805 shows voltage drop. that means TSOP is taking current. What about the working of TSOP? Check the pin connections. From the facing side ( with a bulge) pin 1 is Gnd, Pin 2 Vcc and pin 3 out. Two reasons for this I think . TSOP shorted or Pins changed. Thank you sir. I checked the configuration and short circuit as well. Everything seems perfect. Could there be any fault in the TSOP 1738 itself?